First fry the semai on a dry pan. Meanwhile, in a cup, soak jafran in rosewater. Then heat a pot with water. When bubbles form, add the semail. As soon as the semai turns soft, take the semai and strain it off. Then, rinse it using cold water and set it aside to drain the water. And then heat ghee on a pan and add cinnamon, cardamoms and bay leaves. Once these have warmed up, put the pan aside. 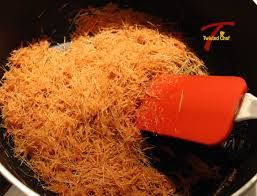 Then add the following ingredients: a little bit of semai, sugar, powdered milk, almond slices, soaked jafran and then semai again. Mix and put the pan back on the heat. Cook it in medium heat ensuring that the semai doesn’t melt away. 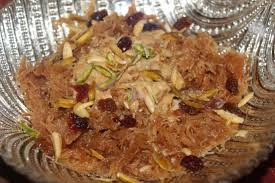 Finally serve this jorda semai any decorated plate or bowl.